The second VSA Race Day of the 2015 Season was another success. The launch was delayed because the weather didn’t look promising, although the forecast few hours earlier, using the RASP, had looked optimistic. Contest launched at noon and the gate was opened at 13:53. Most released in good lift in Bear valley. At the start the day looked good for the task called but with in a hour the sky became overcast with high cirrus and wide spread lenticular cloud formations. The lift was spotty, strong in places but most pilots reported long glides between climbs. The lift was also very much influenced by the convergence which was well east of the Mendocino Mountain ridge line. This made it difficult to get deep into the 10 mile circle around Yola pk. By the time the fleet got back to the south for a run into the Crazy Creek turn the west wind made it difficult unless one was fortunate to contact a bit of wave that set up. By this time the convergence had moved out over Williams so no help on course line. 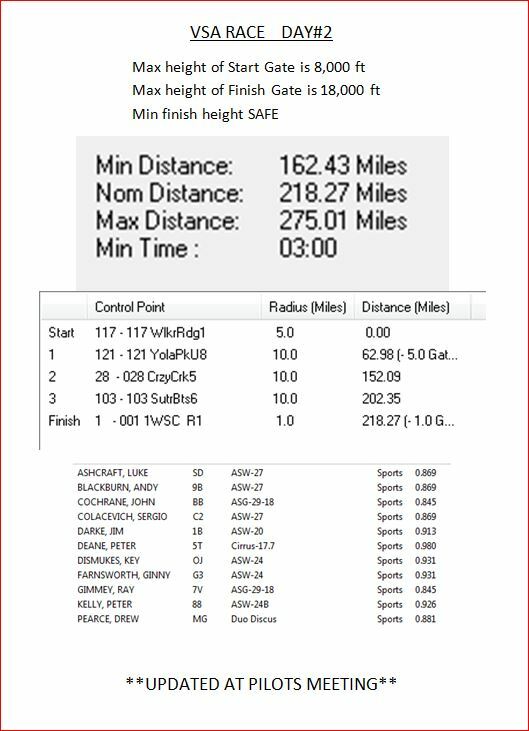 Luke Ashcraft redeemed himself after his defeat on day one, winning day 2, 14 minutes under time with a handicapped speed 49.77mph. Congrats Luke. A few pilots stayed for pizza, beer and fellowship. Many thanks to all who participated hope to see you out for Day 3.